Following the lead of Uber, Ola has given a green signal to cash-less cab rides. Ushering in some very valuable features, Ola Cabs are set to pave way to hassle free cab rides. One can now book an Ola cab through their inbuilt app and “gift rides” to family and friends. It’s just not this, Ola Cabs get “more safe” with a new security feature that helps your loved ones to track your cab ride and with the beforehand information about the driver riding you, there’s little room for errors. What’s more, you get a 100% cash back on your maiden recharge until 31st October, 2014. Gone are the days when you had to force dig your wallets to find the right change to avoid heated arguments. With the built in mobile wallet, you don’t have to either search for the right change or negotiate over tips. All you have to do is recharge any amount from Rs.100 to Rs.5000 like how you’d recharge your prepaid mobile balance, and you’re good to go. The best part is you can recharge even as you are in the cab so you don’t have to shell out cash, though cash payments will not be completely declined. As you book your cab online, you are notified about the details of the driver with the photograph which enables you in easy recognition. Also specified are the phone numbers and the cab number to make sure you’re boarding the right cab. What makes the Ola ride even safer is the new feature of tracking. By forwarding an SMS to a unique link, your loved ones will know your minute by minute whereabouts there by cutting out on your folk’s anxiety. You can recharge your mobile wallet through net banking/debit card/ credit card and book a ride for friends and family. Once the person has reached his/her destination, you will be notified and the amount will be deducted from your Ola account. This feature is sure to work in favor of Ola. Booking a cab for airport calls for differential pricing and previously many had problems in settling for the right amount. For all those who hate the untimely price shocks at the boarding time, Ola has made it easier by giving the users the option for Airport booking with the price made clear. Also to make it further convenient, you can now prick the venue where you’d like to be picked up at on your mobile screens. With a view to make choosing easier, a single window helps you browse the different ETAs (Expected time of arrival) by comparing fares. Also the new feature allows you to estimate the fare from point A to B by different car category, giving information about the ride time. In a press release, “Providing customers a seamless travel experience has always been our priority. We are very excited about the possibilities that our mobile wallet offers and firmly believe that our customers will love this cash-free experience”, said an elated Harsha Kumar of Ola. Though Uber launched these features back in 2013, Ola seems to be trending up to the competition. A direct access to Google maps, hassle free wow cab rides, pioneering cashless payments that the cab industry never heard of, Uber has for sure set a path for the other cab companies to follow. Growing faster than ebay, this San Francisco startup has sure many things to teach other cabbys! 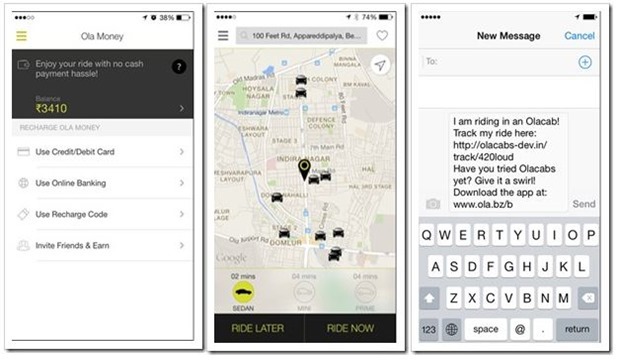 "Ola Launches Prepaid Wallet. Brings Nifty New App Features", 5 out of 5 based on 1 ratings.